India is witnessing one of the most significant events in its fiscal history with the introduction of the goods and services tax (GST), a single comprehensive destination-based consumption tax. India’s federal government is moving relentlessly to achieve its goal of introducing the GST. The CGST Act, IGST Act, UTGST Act, and Compensation to States Act have already received presidential approval. These acts would be effective from the date designated by the federal government. The state governments are also in the process of passing their respective GST bills to introduce the SGST Act in line with the federal government. As of this publication, twelve states have already passed their bills, and the government has urged the remaining states to pass their own bills no later than the end of May 2017. With the constant synchronized efforts of the various governments, GST will likely be implemented shortly. In fact, various media reports suggest that the government envisions GST to be implemented in India as of July 1, 2017. Implementing GST will bring with it a mammoth change in indirect tax levying in India, accompanied by various problems at the ground level for implementation and transition. This article discusses issues that could emerge and that warrant close attention during the transition to the new tax regime. The levying of CGST, SGST, and IGST would be based on the place of supply specified in the IGST Act. Because GST is a destination-based consumption tax, identifying the place of supply plays a vital role in determining whether supply is considered intrastate or interstate. Different parameters have been prescribed for determining the place of supply of goods and services. GST will call for a major change in place-of-supply rules for goods, in that the current provisions identify the place of supply by the origin of the goods, whereas in GST the place of supply will be determined by the destination of the goods. place of supply of service where either the supplier or the recipient is located outside India. Recognition of the place of supply will also become important, since it must be indicated on the invoice. Hence the company must take due care in identifying the place of supply by applying the appropriate rule and charging the applicable tax to avoid litigation. Several changes have been made to the input tax credit mechanism. The existing laws are laced with complexities, as different laws have given rise to the rules governing a company’s eligibility and the conditions under which the input tax credit can be claimed. Frequent amendments have also made it difficult for companies to keep track of changing criteria, resulting either in lost credits for which they are eligible or disputes with the authorities. The GST, with its common provision for claiming the input tax credit, will do away with the complexities that arise from a multiplicity of laws. Also, the governing definition has been widened considerably to allow input tax credits on any goods or services that are used in the course or furtherance of business, thereby reducing the possibility of disputes centered on establishing nexus. The GST law will also bring in a mechanism whereby input tax credits will be available only if the supplier has paid the tax to the authorities and filed a proper return with the invoice details on which the tax has been paid and which is identified with the registration of the receiver. The entire tracking would be done with the assistance of an information technology (IT) platform the government is developing. This tracking would replace the current practice of basing the input tax credit on the invoice issued by the supplier. Other countries are likely to keep a close eye on how successful this mechanism turns out to be, for possible replication in the future. furnishing of return by the dealer claiming credit. The company claiming credit would have to be extra cautious with its suppliers and ensure that the suppliers comply with the GST provisions. An important condition for carrying forward credits accumulated under existing laws is that the registered person should have disclosed the credit in the returns and filed relevant returns for six months before the law has been enacted. Thereafter there will be no chance to claim any credits that may have been overlooked. Companies should therefore actively identify all available credits, disclose them in relevant returns, and file the returns by the due dates to ensure that no credit is missed that can be carried forward into the GST regime. filing GSTR-3 created by GST portal based on GSTR-1 and GSTR-2. There may be additional returns for tax deducted at source, annual returns, and others. These returns need to be filed for every state where the company is registered. Uploading data and filing returns promptly would be a cornerstone of a company’s successful GST implementation, considering the number of returns to be filed throughout the year and the data generation and verification required to do so. In light of the quantum of data collation involved, a company may have to invest substantial time and effort to develop appropriate IT systems to deal with the volume of data and frequency of filing. GST includes the concept of compliance rating for registered dealers, which would be updated at periodic intervals and placed in the public domain. Under GST, a company’s compliance rating would become part of its compliance report card. Compliance rating will help companies to make decisions as they make procurements from vendors so as to avoid credit difficulties in the future. Under such circumstances, officials will have to be aware of compliance, since a lapse may affect a company’s compliance rating and consequently affect its credibility. The concept of “reverse charging” enables taxation of services provided by foreign suppliers so as to level the playing field for local service providers. In India, this concept has also been used with certain services in unorganized business sectors where the government cannot easily manage a large pool of service providers. In such scenarios, the onus is put on companies receiving services from this sector to discharge any tax liability through reverse charging. GST proposes to collect tax under the reverse-charge mechanism not only from specific services but also on procurements from unregistered dealers. At the moment, which goods and services will be subject to taxation under reverse charging have not yet been determined, because GST’s final rules and notifications are still being formulated. What is known is that payment of taxes under reverse charging will create working capital pressure, since companies will first have to pay tax and then claim credit for the payment. Procuring goods and services from unregistered dealers will increase compliance issues for companies. A company will have to issue a self-invoice each time it procures goods and services from unregistered dealers and will discharge applicable taxes under the reverse-charge mechanism. This constraint will add to the compliance burden, requiring that companies keep track of even the smallest purchases and undertaking necessary compliance measures. One of GST’s most discussed features is its anti-profiteering clause, which gives the federal government the authority to monitor the price of goods and services once GST is enacted. The anti-profiteering measure mandates that any reduction in the tax rate on any supply of goods or services or any benefit from an incremental input tax credit be passed on to the purchaser or consumer through a commensurate reduction in price. This provision, which aims to ensure that consumers derive the benefits of tax efficiency, has been a matter of contention, because industries expect significant challenges to their operation and administration. Another factor to consider is that while a company may benefit from a reduction in tax rates, other factors may increase costs. For example, the anti-profiteering provision does not acknowledge nontax factors but rather concludes that the company has benefited due to the introduction of GST and thus must pass on that benefit to the consumer. GST will affect far more than a company’s indirect taxes. A critical aspect of successful GST implementation will be the company’s IT setup, specifically its ERP/accounting software. Automation of tax compliance processes will play a vital role in a smooth transition to GST. Companies should redesign their software applications to capture information according to GST requirements. Doing so entails, among other things, identifying required fields for vendor and customer master data and creating templates for reports to be generated in the ERP/accounting software. Successfully converting the IT setup will depend on orchestrating the work of divergent teams within the company: the IT team, accounting, and tax. Stock transfer (i.e., taking goods from one state to another). Currently, companies do not pay tax in the case of stock transfers against prescribed declarations. Once GST is implemented, however, companies will have to pay IGST on stock transfers to other states within India. Though IGST would be credited at the branch located in the other state, however, the amount of tax would be blocked until it is recovered from the customer. Input tax credit on advance payment. Under the GST regime, if the purchaser has paid the supplier in advance, the supplier is liable for paying GST on the purchase amount. However, the purchaser cannot claim input tax credit until he receives the goods or services. Payment of tax under the reverse-charge mechanism. As noted above, tax payments under reverse charging will create working capital pressure, since the company would first have to pay the tax and then claim a credit for that payment that could be used to discharge the tax liabilities. A foremost challenge for tax professionals is to unlearn the past and to approach the new law with a fresh perspective. Clearly, significant time and effort are required to work past the difficulties associated with implementing the new tax regime. preparing a standard operating manual to ensure compliance. The transition management should involve participation from all business levels as everyone in all areas—supply chain, logistics, finance, and more—will be affected. To view this transformation purely as a change in the tax regime may not do justice to the attention GST deserves from all quarters. 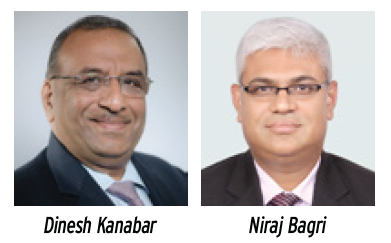 Dinesh Kanabar is the CEO and Niraj Bagri is a partner at Dhruva Advisors LLP.